India's dominant ride-hailing startup, Ola, plans to place 10,000 e-ricks in its service by next April. An electric-vehicle revolution is gaining ground in India, and it has nothing to do with cars. The South Asian nation is home to about 1.5 million battery-powered, three-wheeled rickshaws - a fleet bigger than the total number of electric passenger cars sold in China since 2011. But while the world's largest auto market dangled significant subsidies to encourage purchases of battery-powered cars, India's e-movement hardly got a hand from the state. Rather, drivers of the ubiquitous three-wheelers weaving through crowded, smoggy streets discovered that e-rickshaws are quieter, faster, cleaner and cheaper to maintain than a traditional auto rickshaw. They also are less strenuous than cycle rickshaws, which require all-day peddling. So with more rides possible in a day, the e-rickshaws are proving more lucrative. As many as 11,000 new e-rickshaws hit the streets every month, and annual sales are expected to increase about 9 percent by 2021, according to consulting firm A.T. Kearney. Three-wheeled vehicles make up a $1.5 billion market, and manufacturers of electric versions include Mahindra & Mahindra Ltd. and Kinetic Engineering Ltd., along with smaller outfits that assemble parts imported from China. India is the world's fourth-largest auto market, but previous attempts to boost private electric-car ownership flopped. The government likely scaled back because it fears disrupting an industry that contributes about 7 percent of the total gross domestic product, according to a Bloomberg NEF report in March. Unlike the estimated 1.35 million passenger EVs cruising around China, the number of electric cars plying Indian roads is a paltry 6,000, according to BNEF data. Chinese automakers sell more than that in three days. India's largest automaker, Maruti Suzuki India Ltd., won't sell its first EV until 2020.Prime Minister Narendra Modi's administration now is pivoting toward promoting EVs in public transportation and fleet operations - primarily, two- and three-wheelers, taxis and buses. The Ministry of Finance is finalizing a plan to spend about 40 billion rupees ($600 million) in the next five years to improve the nation's charging infrastructure and subsidize e-buses. "India needs to focus on electrifying two-wheelers and three-wheelers,'' said Amitabh Kant, chief executive of NITI Aayog, a government policy institute helping formulate the new strategy. Outside an east Delhi metro station, a slew of partly open-air vehicles line the street as commuters hail their rides. They also carry tourists, schoolchildren, crates of fruit and the occasional goat. Anil Chaudhary, 32, switched to an e-rickshaw from a cycle model two years ago. His income increased, he's able to take longer breaks and he sends money to his wife and three children in Bihar, about 700 miles away. He's already on his second electric model. "Two months ago, I called my brother from the village and gave him my old e-rickshaw so that he could drive it,'' he said as a goat strolled past. "I've bought this new one," he said, gesturing toward a glossy, red vehicle adorned with paper flowers and an Indian flag. Then there's the ameliorative effect that e-ricks have on the toxic air in India, home to 10 of the world's most-polluted cities, according to the World Health Organization. A total of 635,698 three-wheel vehicles were sold during the fiscal year that ended in March - a 24 percent increase from a year earlier, according to the Society of Indian Automobile Manufacturers. By comparison, about 3.3 million passenger cars were sold, mostly all powered by gasoline or diesel. One hindrance to the potential growth of EVs is the lack of charging and battery-swapping stations nationwide. India had about 425 publicly available charging points at the end of last year. By 2022, government and private efforts are expected to boost that to an estimated 2,800 charging points, according to BNEF. Instead of waiting, some companies are starting to build their own infrastructure. SmartE partnered with Delhi Metro Rail Corp. to provide charging near 10 stations, with plans to expand throughout the 214-station system by the end of 2020. Another hindrance is the lack of bank financing for traditional rickshaw drivers, who typically earn low incomes, said Shishir Agrawal, managing director of Shigan eVoltz Ltd., the parent company of manufacturer GreenRick. 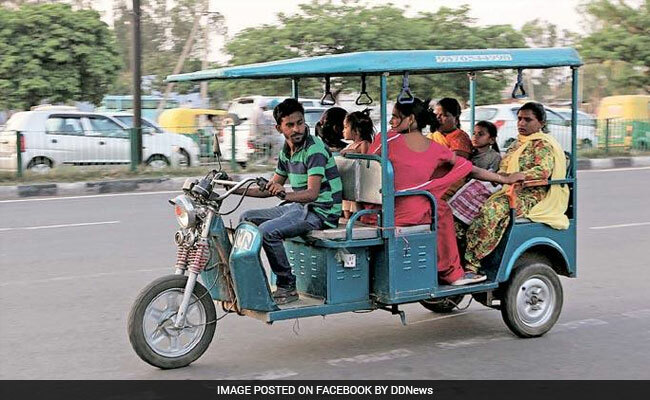 The Gurgaon-based company, which sells e-rickshaws mostly in Delhi and Uttar Pradesh, could more than triple production to 1,000 vehicles a month if that issue was resolved. The potential market for e-rickshaws could be sales of 20 million vehicles a year, he said. "If the subsidies get better, and easy financing options become available, this market is unstoppable," Agrawal said.